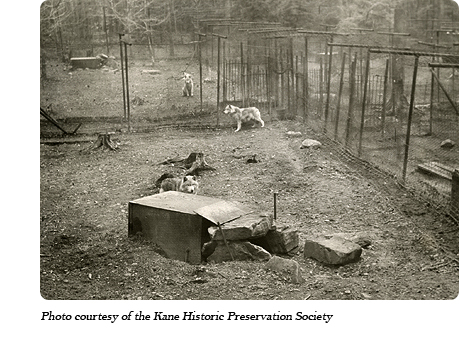 The wolf pens themselves covered about an acre of ground altogether and were constructed of double-strength wire mesh held up by 11-foot-high200 T-shaped metal poles which allowed wire to be placed over the tops of the pens, preventing the wolves from climbing or jumping out. Enclosed runways were constructed to allow for the transfer of wolves between pens. Each pen was about about 60 square feet236 and contained a "den" constructed of an iron box and stone slaps. 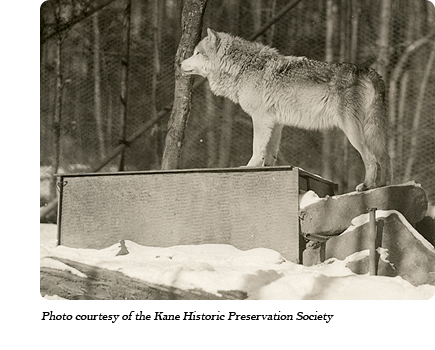 During the birthing season, the floor of the box was lined with wooden plans250 to protect newborn pups from the cold metal. Several signs were erected in the area to advertise the park. In 1932 through at least 1940, admission was 25 cents for adults and 15 cents for children.249,273 By 1950 admission had risen to 30 cents,236 and by 1966 admission was 75 cents for adults235 and 35 cents for children.13 Dr. McCleery greatly enjoyed showing his wolves and describing them to the public.236 He distributed a leaflet to visitors titled "The Only Lobo Wolves In The World,"14 which described the history of the wolves, information about the park, and descriptions of the inhabitants of each of the wolf pens. 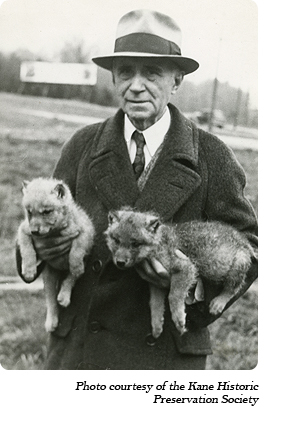 Hoping to expand his wolf parks into a franchise, Dr. McCleery created McCleery Wolf Pack Incorporated and set up a new park between Gap and Coatesville, PA in 1930 for the purpose of exhibiting some of his wolves.195 This venture did not last long, however, and no additional wolf parks were established. Dr. McCleery was an active part of the park well into his 80s. As he entered his 90s, he was not able to visit the park as often, and he began to seriously worry about the future of his wolves. Over the years he had received several requests to purchase them but was very particular in his search for a successor; he was searching for someone who would continue in the same spirit as he had done. 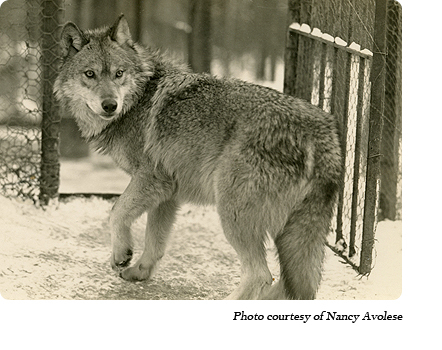 He was firmly against selling them to zoos because his wolves required constant expert attention which zoos could not provide165 (zoos only began to consider conservation as a central role in the 1970s, and that notion did not become widespread until decades later). Jack talked about wanting to move the wolves as early as 1966.235 As time went on, meat became harder to obtain244 and highway changes raised fears of diminishing tourism.248 Jack thought more seriously about moving the pack. 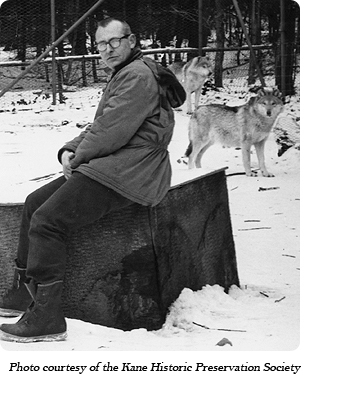 In 1970 he bought a 34-acre plot of land on the Olympic Peninsula in Washington with the inheritance left to him by his adoptive mother.217 Marjorie moved there first,248 and in February 1972, after the wolves had been in Kane for 51 years, Jack moved the 52 wolves and one mountain lion246 to a new location across the country in Gardiner, Washington. 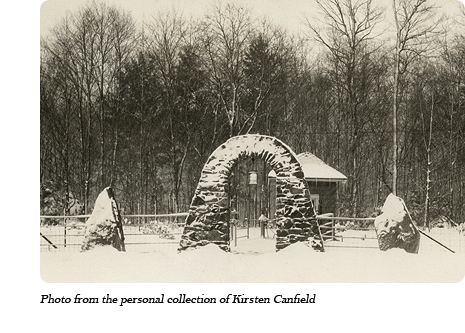 Initially Jack retained ownership of the Route 6 park land which led locals to hope that the wolves might return someday.244 However, the land was sold a year later, diminishing hopes of the wolves' return.245 The wolves never did return to Kane, but the remnants of the park - the stone archway and some of the old pens - still remain at the Route 6 location today. 1The article which describes the park's purchase in 1928 describes the plot as 25 acres, but when it was sold it was described as upwards of 100 acres, so more land was added at some point. Originally it was said that the wolves' pens took up about one acre of land, but since the pamphlets range from describing 5 to 13 pens, I imagine more pens were added as time went on, and if more land was acquired, it makes sense to expand the wolf enclosure area. Enclosures would also have had to have been made for the other animals added to the park - the mountain lions, coyotes, etc. 2According to the 1930 census, Myrtle Jarensky was the proprietor of the wolf park's tea room. 3Information courtesy of Carol Mong Gerbracht, who remembers that Rose ran the tea room at the wolf park when Carol's mother manned the ticket booth. Carol remembers an old Victrola in the tea room and chickens in the yard. She and her family moved from Kane in 1953, so she guesses that the tea room was open (but not necessarily in operation - she was too young to remember) at least in the early 1950s. 4Information courtesy of Ron Stafford. Find out more about the Route 6 park by exploring the Locations - Route 6 tag in the archive.